Woodlawn offers over two miles of wooded trails, a championship croquet court, several large fields, orchards and wonderful gardens which combine to create a full palette of color all year long. The park is open daily sunrise to sunset all year long. 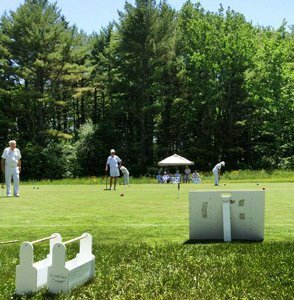 Woodlawn Croquet Program – 2018 Participant Form. Application form for the 2018 Woodlawn Croquet Invitational Tournament. Woodlawn’s trails were built as exercise tracks for the Black family’s horses, and later automobiles were driven on them. Today they are used for cross-country skiing, snowshoeing, running, and walking. Benches are provided near the peaceful lily pond and other locations for rest and contemplation. Click map to download printable version. For over 180 years, stone walls have quietly defined Woodlawn’s boundaries. Measuring approximately a mile and half long, their grace and beauty are testament to a traditional New England craft while quietly reminding us of the estate’s agricultural roots. 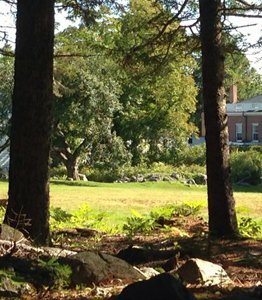 The dry-laid fieldstone walls can be traced to Col. John Black’s use of Woodlawn as a gentleman’s farm, most likely built as fields were cleared for cultivation.